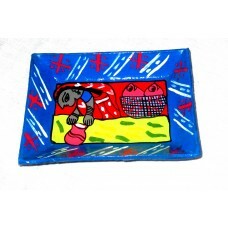 Mithila painting tray is handmade in Nepal by maithali Women. Made of cardboard+Lokta paper. Available in assorted colors. Except slight variation in color,design and weight since the product are completly hand made. Size is 19x14 cm. Available in assorted design. These are very famous. They are hand made.